Eric HB sent me an email asking how I think Ceptr and the ecosystem we're trying to build around it fits with what is depicted in this blog post. I'm posting my reply. And frankly, I wish I'd remember to capture content like this when I write about things in email or other random places so I can start to collect this information somewhere where it's shareable. I think of the collaborative ecosystem we're intending to build around Ceptr as being a kind of community of practice (Remember stones/tumbles/gems which kind of map to his three tiers?). We can have a pre-frontier space for exploration and discussing ideas / needs / requirements / innovations / bounties. Some of those discussions turn into initiatives with teams working on building something which eventually gets published/released into the compository. Published receptors in the compository are sort of the pioneers frontier... although not their raw development or testing environment, because it needs to get triangulated in by a code reviewer and you and the reviewer have reputation riding on whether it works / does what it says it does. Multi-dimensional reputation currencies plus reviews on the compositions help the settlers review, filter, identify what works, and what things work well together, identify patterns. These are second tier innovators who don't want to do coding at the bottom of the stack (tree editor) but in the middle of the stack (graphical receptor connectors tools). They're mashing up components in the new workable patterns. These patterns can (and should) be packaged into new receptors (with dependencies/inclusions of the mashed together sub-components) and published as new compositions in their own right. Stewards of groupensteins or Sovereign Accountable Commons who incorporate (slower than pioneers or settlers) decision making processes for curating the evolution of their group functions (changes in DNA rather than agile brain learning) are the town planners taking applications to scale. They ensure a slower pace of technology change that works for the pace of social change their group can integrate. Ceptr scales by each participant being able to run their own copy of critical local processes and share/store holographically such that everything available can be accessed by everyone without each node having to have a full copy. I know you know most of those things... but I wanted to make it explicit in the context of his story. Truth is with Ceptr there are no clearly siloed tiers. 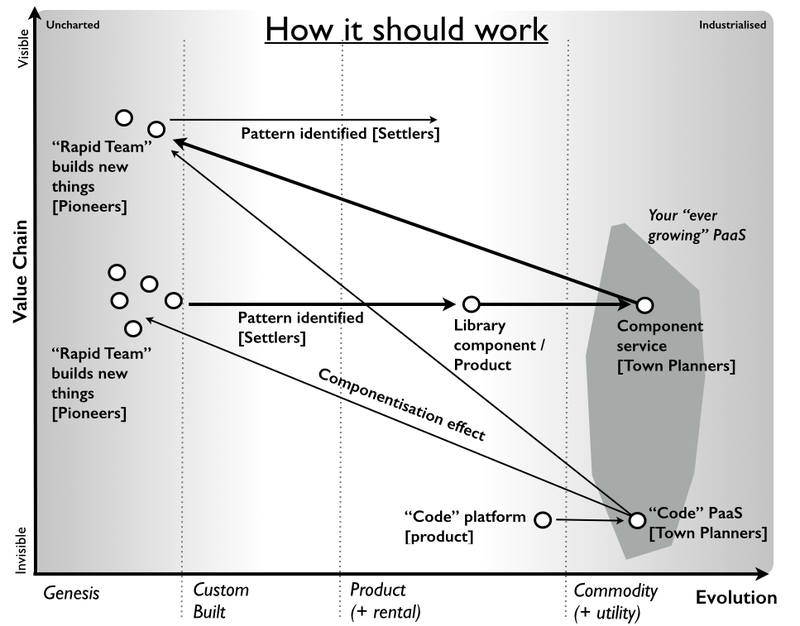 A town planner in one context may be a pioneer or settler in another. And Ceptr may evolve more than three layers since it may accelerate change so much at the pioneer layer that there may need to be a few more layers for the gears to mesh with rates social change integration (especially in slower organizations/institutions/governments), but that's where they will institute their own certification systems or whatever they need to slow down change enough to confront it in their decision making processes. I think the author of the article kind of misses his own point. The point is not 3 vs. 2 levels but the need to ensure that the gears have a way of meshing between levels/rates of change integration. The problem he's pointing to is that levels 1 and 3 don't mesh without 2. But that doesn't mean that 5 levels may not be required if you have compositions evolving as quickly as Ceptr may enable and organizations moving as slowly as governments, churches, schools and big corporations.